Gently fry the onion and garlic in the oil in a saucepan over a low heat until they are soft. Mix in the potato and fry for 5-10 minutes, stirring occasionally. Add the spring onions, cook for a couple of minutes, then add the stock, increase the heat and bring up to the boil. Simmer the soup for 20 minutes or until the potato is meltingly soft. Add the shredded lettuce, return to the boil and cook for 5 minutes or until tender. Liquidise immediately. Mix in the double cream and adjust the seasoning to taste. Depending on the weather, you can serve this soup hot or cold. If serving hot, warm the soup just before serving. In either case, garnish with the garlic chives and their flowers. 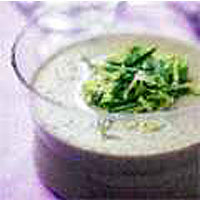 Serve this creamy soup with lots of crusty bread.